I always love it when a cow is in the mood to pose for photos. I snapped a number of great photos of Lily one afternoon in early September, but this photo was my favorite. Jersey cows (and calves) have such unique attitudes and this photo epitomizes that attitude. 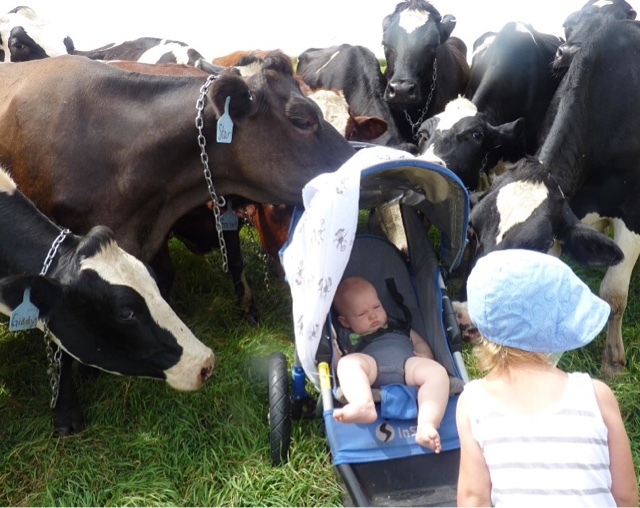 When our neighbors' grandchildren come to visit, they often bring them over to see the calves and chickens or take them out to the pasture to see the cows. This time, they got an up close visit from the cows. 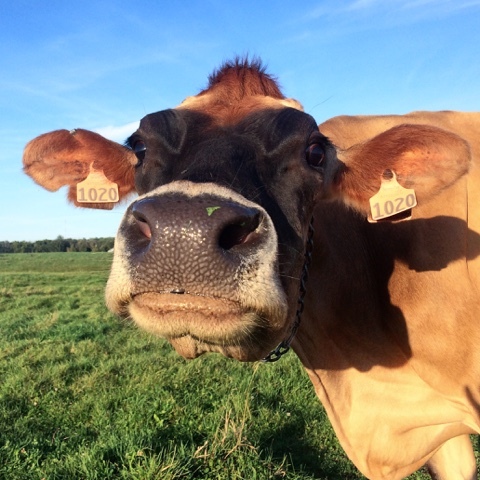 Cows are naturally curious, but their curiosity really piques when new people come into the barn or pasture. Most of the time, one cow will come up close to check visitors out; a grand reception like this one is pretty rare. Daphne doesn't get dressed up very often. If she's wearing clothes at all they're usually barn clothes. So I couldn't resist taking this picture when she showed up in the barn in her town clothes to help me finish cleaning stalls. 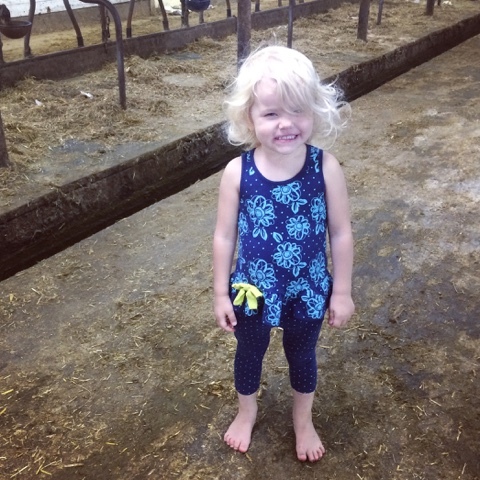 When I posted the photo, though, most of the comments were about Daphne being barefoot in the barn. Well, Daphne is almost always barefoot outside. And I think most farm kids can remember running around barefoot for at least part of their childhood. 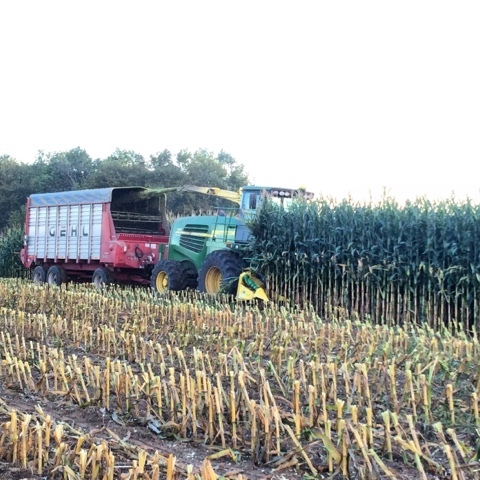 Harvesting corn silage was September's major event. Thankfully, we had lots of help from family and friends and everything went extremely well. I wrote about our incredible harvest in one of my recent Dairy Star columns. It was amazing to see what crops can do during a summer of near-perfect growing conditions. The highlight of chopping for me was riding along in the chopper for the first time. 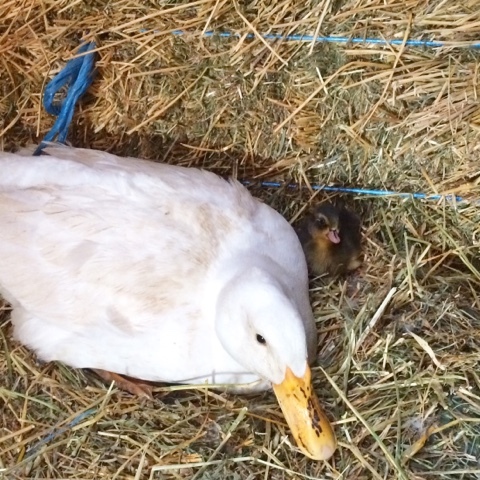 You might remember Mama Duck as the white duck that lived on our pond for most of 2014 and then moved into our barn on the eve of Snowmageddon '14. She then went to live at Glen's home farm for the winter and returned here this summer. She spent all winter setting on a nest of eggs, but none of them hatched. She made a new nest when she moved back here, but no ducklings ever emerged – until two weeks ago. Finally, one duckling hatched and Mama Duck earned her name. I'm sure I've said this a million times and wrote it just as many: I love having friends from town out to our farm to learn more about dairy farming. I met Kim when I was in Washington, D.C. last month; Kim started working at Land O'Lakes in July and said she wanted to learn more about dairy farming. I'm a firm believer that the best way to learn about farming is to experience it first hand, and that's exactly what Kim did. 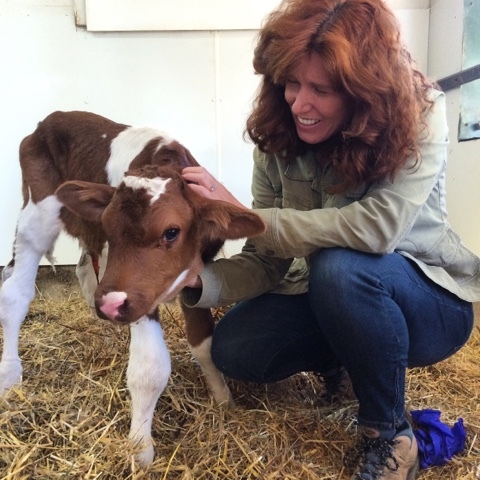 During her visit she milked a cow and fed a calf and asked lots of really good questions. Annette – You're welcome! I hope the parts you're missing are all happy memories.